About Us - MONTANA METAL FABRICATIONS, INC.
We are Montana Metal Fabrications, Inc.
Montana Metal Fabrications, Inc opened doors for business on January 6th, 2003. Although we are based out of Great Falls, we provide services and custom fabricated products to the people and businesses of the entire state of Montana. Our primary service is grain elevator and fertilizer plant repairs and installations. We have mobile units ready for on site repairs, service, and installations! We also provide options for custom hand-made creations. We have a complete fabrication shop capable of shearing, braking, and rolling 1/4" steel. We have hand plasma machines and provide wonderful hand creations such as personalized benches and fire pits. The most recent addition in 2009 was a bending /rolling machine also capable of intricate baskets, scrolls, and pickets which allow us unlimited creativity! From custom handrails, to smaller household decorative items all the way up to large ornamental pieces for yards or restaurants, we can build your dream item! We like to say if you can dream it, we can probably build it! 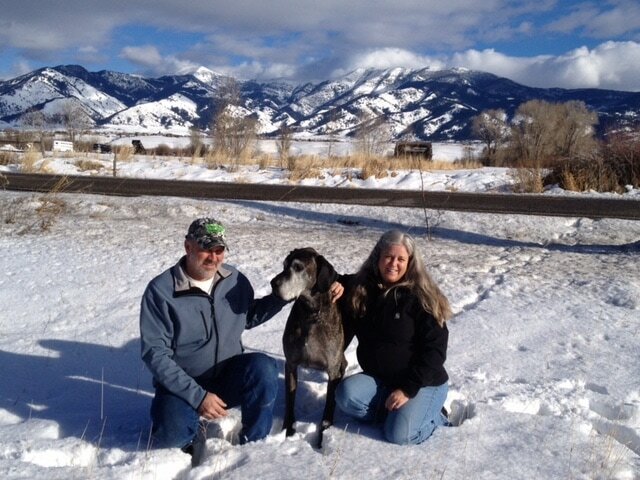 Owners Dean & Wendy Brandt with their beloved great dane, JD. Dean and Wendy Brandt are the owners of Montana Metal Fabrications, Inc. Dean is well known in the grain, fertilizer, feed, and seed plants for quality repairs and service. Dean heads up our crew of great workers and can handle jobs from small repairs up to large new fertilizer plant installations including towers, legs, conveyors, blenders, etc.